A student in Africa was travelling to college on the bus when a friend gave her an old copy of Creation magazine. For the whole 45-minute bus ride, the student told us later, she was enthralled with reading one fascinating article after another. We wouldn’t encourage students to neglect their studies to read Creation magazine, of course, but it is amazing the effect it sometimes has on people. We hear such stories regularly. And it thrills us to hear these spontaneous testimonies from Christians in more than 70 countries. … Like that of the family who live in a lighthouse perched on a rock out in the Pacific Ocean. Surrounded by the awesome beauty and wonder of God’s creation, and isolated from fellowship with other Christians, they eagerly await each mail plane when it’s time for Creation magazine to arrive. And there was the pastor who was in hospital reading some of the latest anti-evolutionary arguments, when an atheist was wheeled in to share the room with him. By the time both men were discharged from hospital, the atheist admitted he was seriously reconsidering his position. Then there is the lady in Wales whose letter to the editor appears in this issue. She was fascinated by the interview we ran with Dr Joachim Scheven about ‘living fossils’. After seeing the beautiful full-page picture of fossil and living ginkgo leaves, which we used as an illustration to show that these trees hadn’t evolved over supposed millions of years, this lady realized that a ginkgo tree was growing in her area. She told the local government body, they sent someone to verify it, found it was rare for that locality, and immediately issued a protection order for the tree. All that from a photo in Creation magazine! We are delighted too at how the Lord works in the lives of non-Christian readers. A young man involved with a major cult started reading Creation magazine. He kept writing to us with questions about creation and Christianity—and we kept answering him and praying for his salvation. But we also challenged him to compare what the cult had taught him with what was in the Bible. Eventually he abandoned the cult and committed his life to Jesus Christ. A couple of years ago, a non-Christian distant relative of my wife—a schoolteacher—called in to visit my family while she was in town. My wife showed her some issues of Creation magazine and told her I was the editor. She was impressed, and asked if she could take the magazines home. Shortly after this she found that some friends of hers were already subscribing to the magazine. Her interest in Christianity grew and she soon became a Christian. Then her husband also received Christ as his Saviour. They now attend church regularly with their young daughter, who is growing up as a fine Christian too. It encourages us too that so many other magazines around the world seek us out to reprint our articles. In these days of growing liberalism, falling church attendance, and Christian publications closing through lack of support, we are humbled that our Lord is giving us remarkable increases in readers. So we are glad that other Christian publications see the necessity of getting back to the basics of Christianity, and use our material to fight the anti-Scriptural doctrines of evolution and humanism. Our reprinted articles have appeared in publications in Sweden, Poland, the Netherlands, Russia, Spain, Switzerland, Peru, Mexico, and many other non-English speaking countries, as well as countless English-language publications. One day a small magazine arrived for me, written completely in an Indian script. I had no idea why anyone would send me a magazine I couldn’t read, until I noticed the name ‘Noel Weeks’ written in English among the Indian characters. I worked out that someone in India had translated an article from Creation magazine which university lecturer Dr Noel Weeks had written for us some years ago. People sometimes ask what has been the most popular article we’ve ever published. Requests for more information on this find came in from all over the world for years, even though we had no more information. Several universities and public libraries were bombarded with requests from Creation magazine readers trying to get photocopies of The Illustrated London News article for talks, sermons, Sunday school classes, and just to show friends. 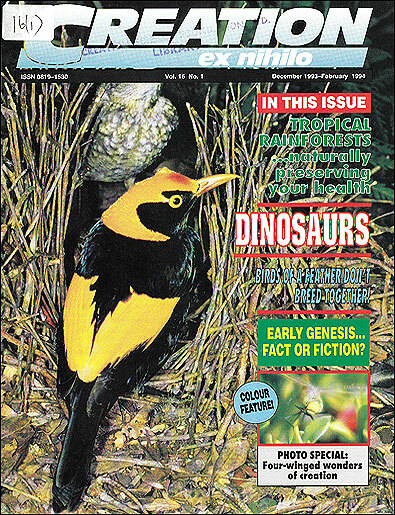 Our most popular subject by far has been dinosaurs, with hardly an issue of Creation magazine going by without either a news report or article on these amazing creatures. With the latest dinomania fuelled by Jurassic Park, Christians have looked to us and other quality creationist books for information to counteract the evolutionary brainwashing that has ridden on its tail. With other articles, the most reprinted editorial was ‘A golden calf is replacing the God of creation’ (March–May 1991), which pointed out how subtly society has replaced the God of the Bible with a god made in its own image. It was reprinted in 13 other Christian publications—including a fairly liberal church magazine by a sympathetic editor, who suddenly found himself the object of wrath by indignant readers who, tragically, suggested he should stop believing everything he reads in the Bible. A number of prominent people regularly see Creation magazine. A leading government anti-corruption official loves it. A former police commissioner gets it. People at NASA read it. The King of Tonga has seen it. Some of the world’s leading scientists wouldn’t miss it. Many well-known church leaders, Bible translators, and effective Christian missionaries use it. But most readers are people like you! Australia’s Macquarie Dictionary (the Australian equivalent of Webster’s and Oxford) has used Creation magazine as its reference for now including creation science in its Dictionary of New Words. Unfortunately, the evolution-soaked Encyclopaedia Britannica still discriminates against creation science by refusing it an entry. You will realize from all this that Creation magazine has become more than just a source of information and a faith-strengthener to help students, missionaries, pastors, teachers, and Christian families—and is also much more than just informative entertainment. The Lord has brought together a unique team of regular contributors, and workers behind the scenes, to provide a quality magazine which He is using to smash down major anti-biblical blockades. Yet none of the writers, artists, photographers, typists, reviewers or any others works exclusively on the magazine. We all have other tasks aswell. Many volunteer their services for no payment. We largely avoid advertising, cannot pay for articles or most photographs, and we have a small budget each issue that amazes people when they see how much is done with it compared with big-budget commercial publications. In addition, many copies of Creation magazine are supplied free to high school libraries, prisoners, missionaries, and people in Third World countries who cannot pay, and who may pass a single magazine around to hundreds of others in their village or school. Only through the Lord’s kindness are we able to present a magazine that is all those things to all those people. The Lord produced a big Bible through small men—so we are more than happy to let Him build our magazine for His glory. God is using Creation magazine to give Christians answers to strengthen their faith, and to cause non-Christians to reconsider whether they can honestly continue believing the crumbling theory of evolution. Those are wonderfully encouraging words. And we can understand how the early Christians would have felt to receive such a message from the Apostle Paul, for it is a paraphrase of 2 Corinthians 9:12–13. We feel privileged at having so many readers like yourself who help us spread the message by giving gift subscriptions, who send photographs for us to use at no charge, who regularly pray for us, who donate their valuable time and money, and help in countless other ways. And we feel truly honoured to be a part of supplying the Gospel of the Saviour and Creator of the world, Jesus Christ, to those who are responsive to its truth. That’s why we believe it’s so important to provide Creation magazine to the world!